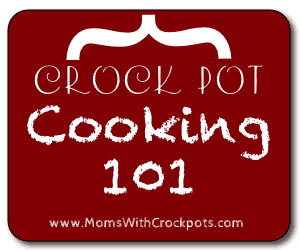 While I know crockpotting is considered one of the easiest cooking methods around. There are still ways to mess it up. So, I decided to start a Crock Pot Cooking 101 Series to kinda give you some Tips & Tricks on the best ways to use your crock pot or slow cooker. This week we are covering some basics. When buying a slow cooker look for one with a removable crock. You can thank me later. The Low setting on a slow cooker is about 200 degrees F and the High Setting is about 300 Degrees F. Depending on the age and the brand of the slow cooker this can vary considerably. Become familiar with your slow cookers temperatures. PAY ATTENTION! This is the reason so many people feel that crockpot recipes fail! Each time you lift the lid, enough heat will escape that the cooking time should be extended by 20 minutes to half an hour. To check progress without lifting the lid, spin the cover until the condensation falls off. Then it’s easy to see inside. Stay tuned for more Crock Pot Cooking 101 tips! Can you post your recommendation for a crockpot again? I know there was a programmable one that you love but I cannot remember the brand. Thanks! Thank you for doing this! This is a great idea!